The eCharts.Settings.ini file contains NAVBLUE Charts+ Windows low level settings that cannot be updated through content packages via EFBConfiguration.xml. You will be able to locate the file in C:\Program Files\Navtech\Navtech Charts on an 32 bit system and C:\Program Files (x86)\Navtech\Navtech Charts on a 64 bit systems. Let's have a look at the global setting used by eCharts. Desc: Set the full path to the customer data directory. Desc: Set the full path to the application data. Desc: Determine the aircraft location data provider to use. Desc: Determine application data provider to use. Desc: Determine what aircraft parked status provider to use. Desc: Set the full path to the read-only source folder for packages (if applicable). 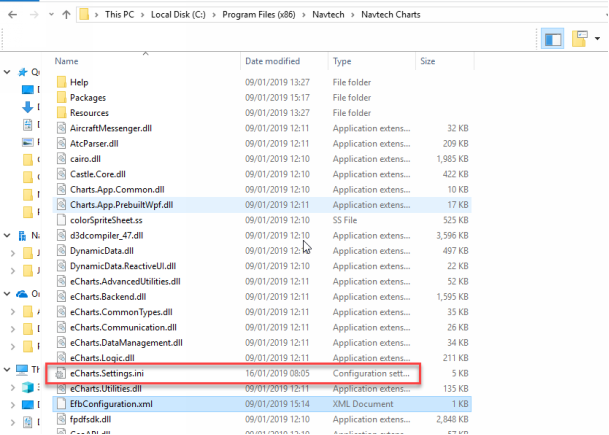 Desc: Set the full path to the source folder for search patterns (if applicable). Desc: Parameter that specifies the FOMAX web service URL. Desc: Parameter that specifies network connection mode. Used by FOMAX web service. Desc: Determine whether or not the custom virtual keyboard is available to user. If the application is installed in LPC-NG mode, then this value is overridden to TRUE. Desc: How the NAVBLUE data update service work. Desc: Select the number of old terminal charts revisions that will be kept in the data directory after a purge. Desc:Set the full path to the directory where the Enroute data files are stored. Desc: The standardized id number of the reference system to be used for the Enroute map at start-up (large scale). Desc: Below this scale the Enroute map may switch to UTM reference systems (also see UseUTM). Desc: Determine if the background Enroute map will be rendered with anti alias. This looks much better, but may slow down performance. Use False for better performance. Desc: Determine if all features will be rendered with anti alias. This looks much better, but may slow down performance. Use False for better performance. Desc: Determine if the Enroute map display is rendered in tiles. Set to True if graphics rendering is fast, but can affect performance if graphics rendering is very slow. Set to False if the processor works at 100% for long periods of time. Desc: If a flight data provider (such as LPC-NG) is installed, connection parameter.